In August 2018, from the 14th to the 16th, representatives of streetfootballworld facilitated a football3 and youth leadership seminar for 85 young leaders from 17 different districts of the Ukraine. Hosted by the National University of Internal Affairs, the seminar was held in Kharkiv, a cultural and industrial centre located in the North-east and Ukraine’s second largest city behind the capital, Kiev. 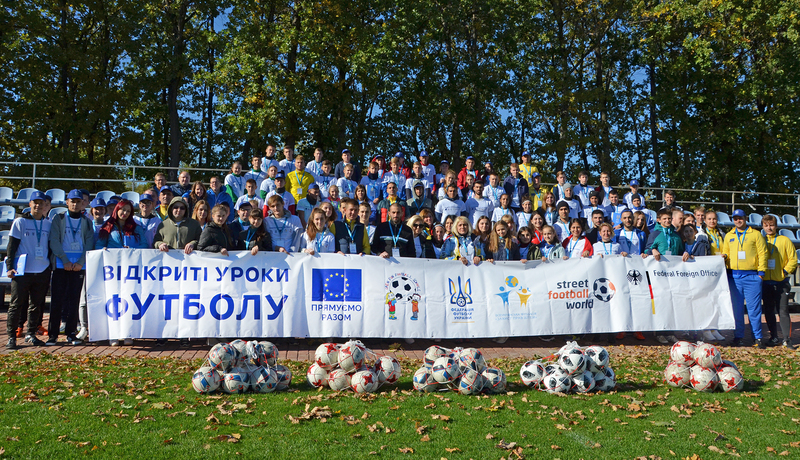 The seminar was part of the Europe Aid funded project run by streetfootballworld network member Cross Cultures Project Association, the Football Federation of Ukraine, the All Ukrainian Foundation for Children’s Rights and streetfootballworld. The four-year project is focused on civil society and public sector cooperation for reconciliation, social integration and child protection in the Ukraine. Against the backdrop of the ongoing conflict in Eastern Ukraine and the displacement of over a million people, the project will see the mobilisation and capacity development of instructors, voluntary coaches and young coach assistants and the implementation of Open Fun Football Schools and after-school activities for children across 17 districts. This will be complemented by network building and further capacity development of CSO representatives, teachers, community police officers and young leaders, development and implementation of school activities and parent meetings in schools across the 17 districts and promoting the exchange of experiences, lessons learned and the integration of international best practise. The football3 elements of the seminar, which took place on and off the pitch, consisted educating the Young Leaders on the football3 methodology, guidelines and match rules as well as football3’s ability to connect people and effect change in their communities. This included football3 matches, during which the young leaders, supported by expert mediators, had an opportunity to experience the game first-hand and familiarise themselves with the game’s guidelines. The personal development elements of the youth leadership seminar focused on three main areas; personal development, mentoring and mediation and communication for social change. The purpose was to develop the skills, confidence and impact of the young leaders in order for them to put these skills and attributes to use in their own communities and projects. The young leaders learnt mediation skills such as active listening and facilitating communication between participants and techniques to help manage and resolve problems or disputes they may encounter. The young leaders, full of energy and enthusiasm, were eager to spend as much time as they could on the pitch, despite the 35-degree heat. The seminar enabled the young leaders to experience football3 for the first time, learn to mediate matches and develop plans for the implementation of football3 sessions in their home communities. As part of the youth leadership element of the programme, the young leaders developed skills on leading themselves, leading others and leading their community. Overall the seminar was a wonderful opportunity for young people across Ukraine to come together and develop their skills to strengthen their communities and foster reconciliation using football.